You'll be £12.99 closer to your next £10.00 credit when you purchase With the SAS and Other Animals. What's this? In 1970 at the height of the Cold War, the young Sandhurst-trained Sultan Qaboos of Oman, with secret British military backing, took on the communist rebels in a fierce but little known war. Along with regular British Army and 'contract' officers, the SAS played a key role in this bitterly fought but ultimately successful campaign. The value of winning the 'Hearts and Minds' of the local population was quickly recognised and this is where a select band of Royal Army Veterinary Corps officers came in. The local economy was a primitive one based on agriculture and the author, freshly qualified and, by his own admission, somewhat naïve particularly in military matters, found himself solely responsible for the veterinary care of a territory the size of Hungary. Attached to D Squadron, 22 SAS, Andrew Higgins learnt how to respond to the Jebali people's love and concern for their animals who provided their livelihood – goats, camels, sheep, horses, cattle, even bears, hunting birds and pedigree hunting dogs. His first-hand experiences and anecdotes of life dealing with every level of Omani society from The Ruler to poor pastoralist farmers and their varied livestock make for wonderfully atmospheric and often amusing reading. In short, With the SAS and Other Animals is an unusual and potent mix of Special Forces action and veterinary experiences. Readers may well conclude that it really shouldn't have happened to a vet even in a desert war! This book does more than it says on the cover. It's a veterinary memoir that also offers insight into British Military Interventions abroad. Andrew Higgings writes well. He does not inflate his achievements, although he and his predecessors obviously did their profession proud, and his trepidation as a young veterinary surgeon at some of his daunting challenges is engagingly described. I enjoyed this book, as a former RAVC veterinary officer, but I also enjoyed it equally as a disinterested reader for its perspective on current issues, on men's attempts to do their best, and on a fascinating episode of British History. I commend this book to you. This delightfully written book succeeds on several levels as a Military history, an adventure story, a handbook for young RAVC COs who continue to have compatible opportunities to win hearts and minds, and a window to the turmoil affecting several Arab countries today. An authoritative foreword, an essential glossary and a guide to further reading round off a valuable volume of veterinary literature. When Suffolk based author Dr Andrew Higgins became attached to 'A' Squadron 22 SAS, he suddenly found himself responsible for the veterinary care of a territory the size of Hungary. With British assistance, the sultan Quaboos of Oman took on an army of Communist rebels and disrupted the lives of local farmers whose primary livelihood were the goats, camels and cattle they relied upon to survive. This is where Dr Higgins story begins as he deals with life in a war zone from the rarely seen point of view of a vet at the heart of a military incursion. Full of fascinating and often humorous anecdotes, this is a wonderful story of courage and humanity which will charm and entertain in equal measure. This is where Dr Higgins' story begins, as he deals with life in a war zone from the rarely seen point of view of a vet at the heart of a military incursion. Full of fascinating and often humorous anecdotes, this is a wonderful story full of courage and humanity which will charm and entertain in equal measure. 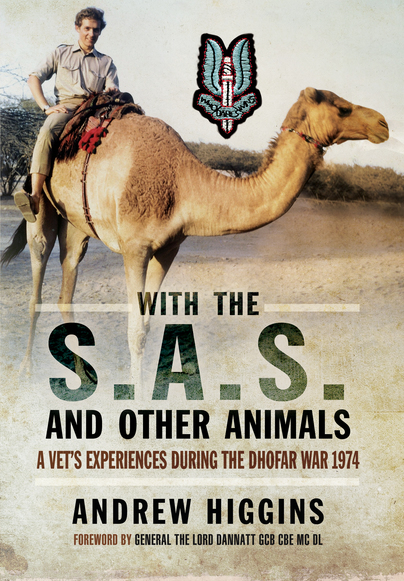 Andrew Higgins's With the SAS and Other Animals is the story of the author's experiences as a vet with the SAS in the Dhofar War in 1974. His role was to win the local Omanis' 'hearts and minds ' by ministering to their livestock – goats,camels,sheep and cattle-and then Sultain's menagerie of exotic birds, hyenas and beats. It's not only fun to read buy also rather good account of another largely forgotten campaign, from a distinctly unusual perspective. Plucked from the damp of Northern Ireland where he was serving with the Army Dog Unit at the height of the “troubles” in 1974, Andrew Higgins, a recently graduated veterinary officer in the Royal Army Veterinary Corps, finds himself whisked away on an emergency six month tour to the deserts of Oman attached to the SAS who were spearheading the secret military backing of the Sultan in his fight against communist rebels in the fierce, successful but little known Dhofar War. The ultimate success of any military campaign requires winning the hearts and minds of the local population and this was as true in Oman in 1974 as it is today in Afghanistan. The desert economy in Oman was primitive and very dependent on livestock whose health lay in the hands of witch doctors and their cruel and totally useless remedies. Andrew, with minimal military or veterinary experience, finds himself solely responsible for the veterinary care of a country half as large again as Britain. In a humorous style reminiscent of the James Herriot stories, Andrew recalls his many adventures dealing not only with the native tribesmen and their animals but also with the Royal Household. Courtesy of modern medicines he is able to perform miracles on dying animals and deals with the impromptu establishment of a Royal zoo which arrives unexpectedly from India. A lesser man would have buckled under this kind of pressure but Andrew thrives and all too soon his six months is up. Faced with the prospect of a return to a desk job in the Ministry of Defence, Andrew takes the tough decision to transfer to the Army Reserve and accept the appointment as Veterinary Officer to His Majesty , the Sultan of Oman. This book is very readable. I found it hard to put down. It gives a wonderful insight to local and expatriate life in the Middle East at the time. The SAS, to which Andrew was attached, feature throughout the book. They are portrayed not only as the elite professionals we are familiar with but as caring, compassionate human beings. The book title refers to them as “animals”. Rather than being an insult this must be the highest form of compliment for any human. This is an excellent book. I hope there is a sequel. This is a book not to miss. This is not “Herriott on a camel” but it is an informative and entertaining account that the reader will find absorbing and enjoyable. The author provides a rare insight into the secret war being fought in support of Sandhurst-trained Sultan Qaboos of Oman by regular British Army and “contract” officers. This is a brilliant book. It needs a place on the shelves of every book-lover with an interest in the Army, the Middle East, expatriate life in a developing country and that vital response to the many challenges of a life under unusual circumstances: Can do. Andrew Higgins comes to serve a largely impoverished, fatalistic, hardy and feudal society moving forward under the rule of an enlightened Sultan. The majority of Dhofaris are highly dependent on and attached to their livestock. With very little previous experience Andrew provides an enormous assortment of animals, which he clearly loves, with a veterinary service ranging from emergency surgery to disease prevention. He also attends to a wide range of creatures belonging to the palace in Muscat, including a completely new zoo (Chapter 14), which suddenly arrives from Bombay. He benefits from the amazing resourcefulness of a civilian and military British expatriate community, whose origins are largely in the British armed forces. Of the SAS (Chapter 11), to which Andrew is attached, we obtain a new, less sensational but more informative picture, one of a body of men who add ingenuity, maturity and compassion to the more obvious virtues of outstanding courage, physical fitness and interdependence. The book's readability arises from a number of discernible factors. It is well written, light and humorous. It is modest and does not blind us with science. The account is based on notes made at the time of Higgins's posting in 1974 and proceeds sequentially through the six months that he spent in Oman, but, in that there is a theme indicated by each of the chapter headings, this is much more than a memoir. It will be a warm glow. Dr Andrew Higgins is a graduate of the Royal Veterinary College (University of London) with a PhD and MSc (Edinburgh). His exceptional professional credentials include fellowships of the Biological and Zoological Societies, Editor-in-Chief of The Veterinary Journal. He is involved in many animal charities. He lives near Bury St Edmunds, Suffolk.